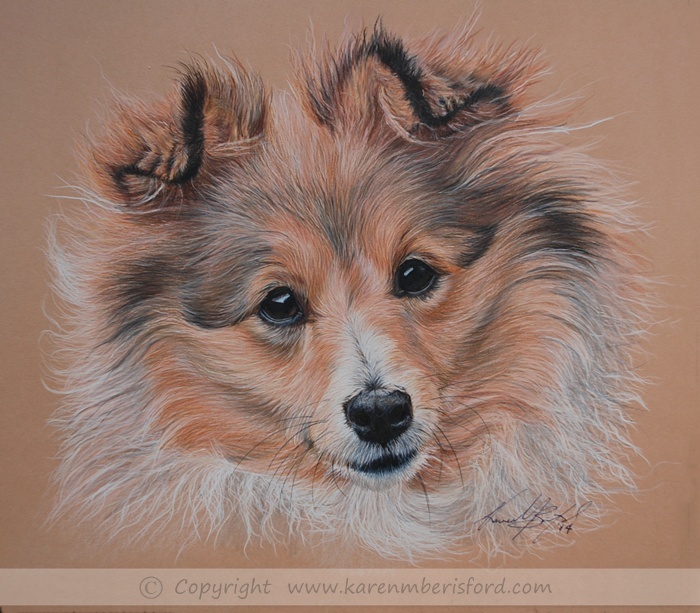 This gorgeous little Shetland Sheepdog called Lexi, was created as part of a trio of portraits and all produced in Coloured pencils. I went up to meet Lexi ad her brother and sister, so I could get an idea of their personalities and take some quality photographs to use as reference. They are such tiny little dogs with BIG fur but they were so very friendly and it was a pleasure to just sit and watch them for a while. Studying a subject certain plays a huge part for me in the final portrait. I had trouble selecting the best reference photo as I had captured some lovely ones but finally settled on this one because of the inquisitive pose. Long fur is easier to produce than short fur and I was lucky that I was able to pick out all the details and apply the flow of fur for greatest effect - the hardest part was knowing where to stop with all that fur! Thank you for the wonderful portraits of our gang, especially of Sam now he is no longer with us, it will be a lasting memory and fitting tribute to a wonderful dog who gave us so much. Thank you again!